Ezekiel 1:1 tells us that the prophecy began “in the 30th year.” Scholars usually consider this a reference to Ezekiel's age, making him about the same age as Daniel, who was exiled to Babylon nearly a decade earlier. Like many priests of Israel, Ezekiel was married. But when his wife died during his prophetic ministry, God prevented Ezekiel from mourning her in public as a sign of Judah's lack of concern for the things of God (Ezekiel 24:16–24). Ezekiel's prophecy began a mere five years into his time at Tel-abib (Ezekiel 1:2), and he continued to prophesy among the people for at least 22 years (29:17). 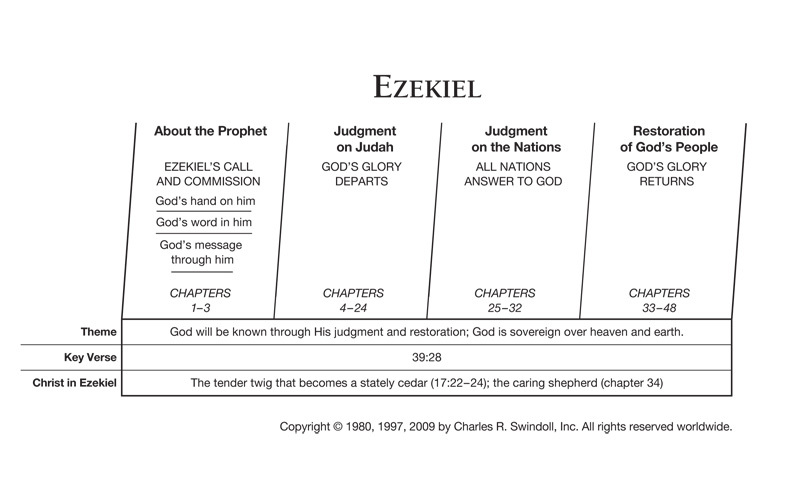 Because he spoke to a people whom God had exiled due to their continued rebellion against Him, a majority of Ezekiel's message communicates judgment for sins committed (1:1–32:32). However, like all the prophets, he also provided his people, now without a land of their own, some hope for the future (33:1–48:35). God didn't exile the Israelites primarily to punish them. God never has been nor is He now interested in punishment for punishment's sake. Rather, He intended the punishment or judgment in Ezekiel's day as a means to an end—to bring His people to a state of repentance and humility before the one true God. They had lived for so long in sin and rebellion, confident in their own strength and that of the neighbouring nations, that they needed God to remind them of His holy nature and their humble identity in a most dramatic way. After centuries of warnings, prophetic messages, and invasions, God decided that more significant action was required—He had to remove the people from their promised land. Ezekiel's entire prophetic ministry centred around the small exiled community at Tel-abib, a people uprooted from their homes and livelihoods living out their days in a foreign land. Can you imagine the feelings of disorientation and confusion that accompanied these people? Even though many of the exiles were directly engaged in the sinful behaviour that led to God's judgment, that would not prevent them from wondering why all this was happening to them. Find resources in the book of Ezekiel in our resource library.